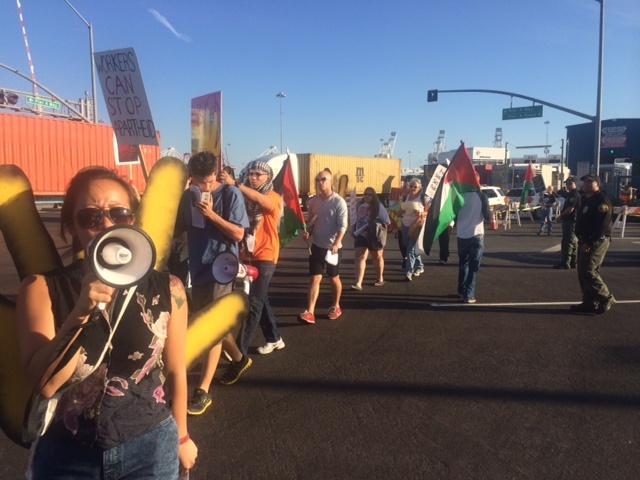 LONG BEACH, California — A group of pro-Palestinian activists with the group “Block the Boat” failed Monday to block an Israel-based cargo ship from Zim Integrated Shipping Service from docking. The group, affiliated with the anti-Israel Boycott, Divestment and Sanctions (BDS) movement, could not stop the ship from unloading, but delivered a message of disdain for the State of Israel. Chants of “Netanyahu you can’t hide. We charge you with genocide” and “1, 2, 3, 4, occupation no more! 5,6,7,8 stop the oppressive Israeli state” clamored throughout the air at the port as the activists walked back and forth across a busy intersection Monday afternoon. Activists from the anti-war group Code Pink were also present, holding up distinct hot pink signs, one of which read “Netanyahu: War Criminal!”. Beneath that banner was a link to moveoveraipac.org, a website that is devoted to opposing the American Israel Public Affairs Committee (AIPAC), which lobbies on behalf of a strong U.S.-Israel relationship. Block the Boat recently diverted a Zim ship from docking in Oakland, California. Their goal on Monday was to do the same in Long Beach. However, organizers of the “solidarity” movement acknowledged that there were not enough participants present. A law enforcement officer had even stated that if the protesters blocked the cargo from coming through and inhibited the flow of traffic, that they could face arrest. Approximately 10 police officers were at the dock to ensure the activists were allowed to carry out their rights of free speech–and no more. Among the roughly 30 participants, two said that they were Jewish, though they had never visited Israel or the Gaza Strip. One woman in her 40s said she believed Israel should not exist and that Israelis should relocate to another country and relinquish the land to the Palestinian people. Of the demonstrators, only four claimed Palestinian origin. At least two of the four Palestinians identified as Christians. The Zim ship docked at approximately 5:45 pm. The activists conveyed an air of defeat. However, one of the organizers told the small crowd that they should consider their protest a “victory” and that their actions would be heard in New York and Seattle (locations of other Block the Boat demonstrations). “There may be a ceasefire now but that does not mean that our actions should stop,” she said. “Please sign up for further actions…We are going to keep educating people and keep raising awareness. I know that you will be doing it until this occupation ends,” she said.